Cakey loves her toy puppy, it goes everywhere and is a constant source of anxiety for me... please, please let us NEVER lose puppy. Our entire house would fall apart and the world would end!!! Anyway the point I am trying to make is that Cakey loves anything and everything to do with puppies. 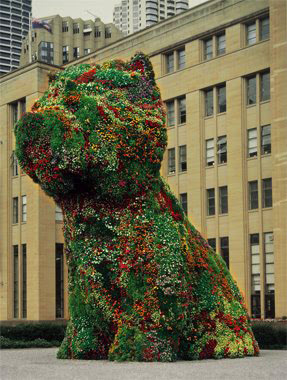 So I found a photo of the Puppy sculpture by Jeff Koons that I saw when it was being exhibited in Sydney many years ago. The puppy is a huge sculpture of a west highland terrier made from living flowers on a steel structure. I am guessing there is some dirt in there too. It is beautiful. We decided to make our own puppy sculpture but on a much smaller scale. I vaguely thought about trying to create a wire mesh structure and filling it with soil and flowers but that thought got quickly relegated to the too hard basket. Instead we used playdough. 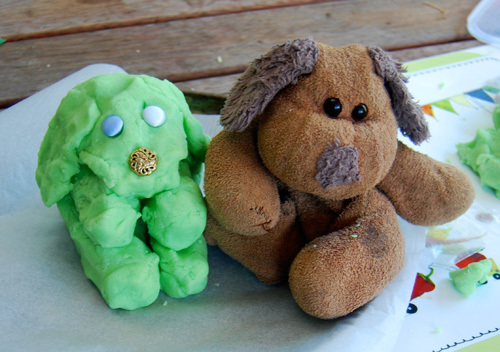 Using toy puppy as our model we constructed him together, I made one side and Cakey made the other. We found some buttons to use as eyes and a nose. When puppy was sculpted we popped him and two baby puppies into the oven to harden... but it didn't really work. You see we did this project before I knew anything about salt dough, which will harden in the oven. Normal playdough doesn't. The surface of our playdough puppy did dry out so I figured that would have to do. Can you see the likeness? 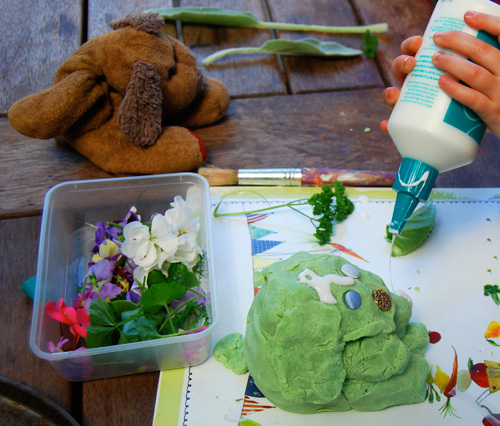 We collected flowers from the garden to decorate our puppy sculpture with. 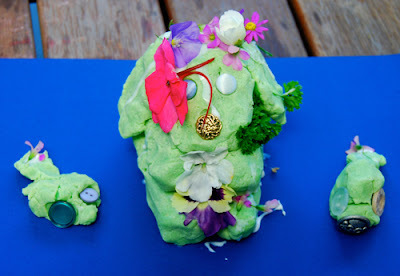 We tried to sticky tape the flowers on but sticky tape doesn't stick to playdough. In the end we glued them on with pva. We learnt a lot from our failures. Our flowery puppy sculpture sat on our outdoor table being admired by all, until the flowers died and we removed him to the bin. Toy puppy lives on strong! 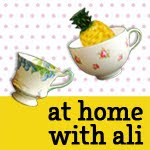 For future I have found a recipe for salt dough – one cup water, 2 cups plain flour, 2 cups of salt. 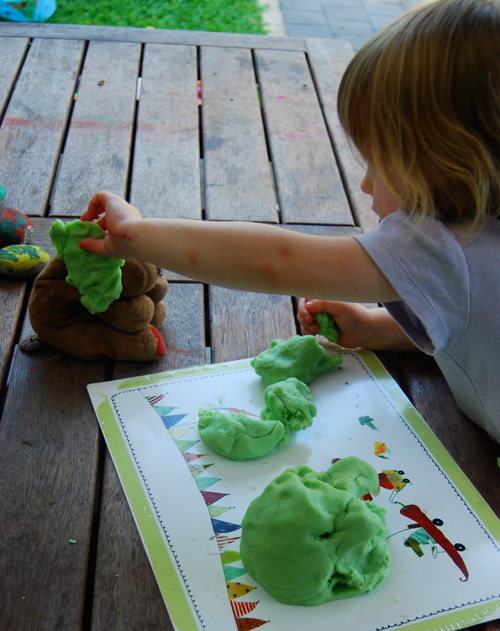 Check out the Nurturestore playdough ebook for more instructions and playdough recipes. This is the perfect activity for something I have up my sleeve. 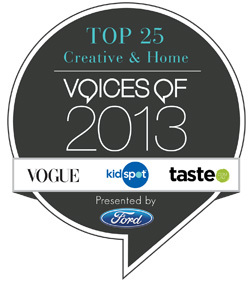 ;) keep an eye out for the link back here! How much fun and I love that this could be tailored to each child's own favorite animal. Flowers and puppies are definitely a big score for little kids!! Thanks Rebekah. Yes it could be tailored - I hadn't thought of that. Great idea. I love your puppy! What a fun art project! That play dough puppy is so cute!!!! 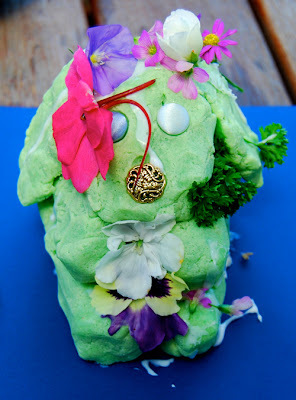 Thanks, if we do something like this again hopefully salt dough will work better. Oh my, that is so cute. I love how she is comparing the sculpture to her toy dog.. and so cute with all the flowers. Wonderful post!!! She did a fantastic job on that puppy sculpture! I can definitely see the likeness. And what a beautiful placement for the flowers.